Living paycheck to paycheck is frustrating and stressful. It’s a financial treadmill that makes it difficult, if not impossible, to save for the future. Yet many people are caught in the paycheck-to-paycheck trap. About 40 percent of adult Americans in 2017 had too little cash on hand to cover an unexpected $400 expense, according to a Federal Reserve survey. Even without a surprise expense, 22 percent of adults were unable to cover all of their monthly bills. Escaping this financial trap isn’t easy. Among those trying to free themselves is Bridget Smith of Everett. Smith, 38, has an established career as a licensed practical nurse. 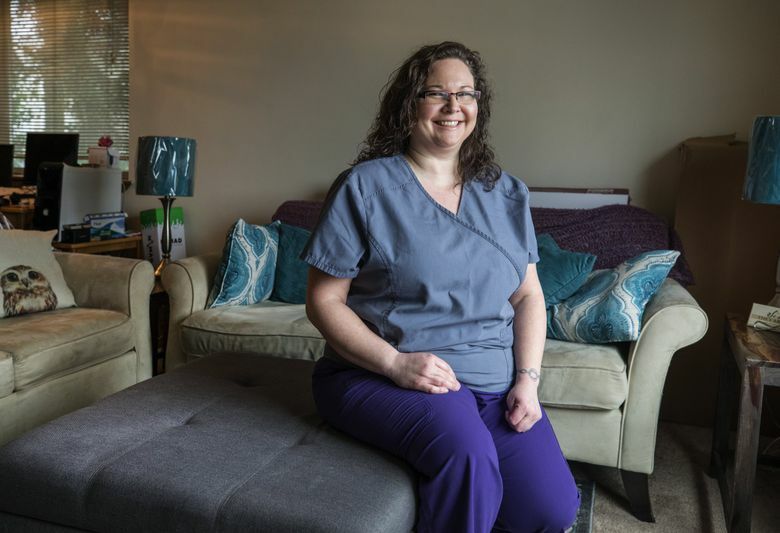 She currently earns between $46,000 and $49,000 a year before taxes working for a large health-care organization in the Greater Seattle area. Much of her work is in King County. She has no other income or notable assets, such as a home or a retirement account. She does not receive child support. Divorced since 2016, Smith is a single parent whose 15-year-old son lives with her most days of the week. Her earnings are below King County’s median household income, which soared 36 percent in 10 years to a projected $89,142 in 2017, according to the state Office of Financial Management. Nonetheless, Smith’s two-person household is considered middle class for the Seattle-Tacoma-Bellevue market, according to an online calculator, developed by the Pew Research Center, that takes into account household income and size, among other things. Smith has checking and savings accounts. But because her household finances are break-even at best, Smith’s account balances turn over monthly without any cash carry-over. Whenever Smith has a monthly deficit, which is often, she covers the shortfall with borrowed money. Her debt has become increasingly burdensome. Smith owes $4,000 on her car and about $13,000 on a debt-consolidation loan that she took out in 2017. She also has a combined balance of about $6,800 on two credit cards with interest rates in the vicinity of 15 percent. The biggest entry on Smith’s debt ledger is an estimated $44,000 in student loans. She financed her nursing degree from North Idaho College in Coeur d’Alene, Idaho, with federal Pell Grants and loans. Smith then enrolled in the income-based repayment plan through the U.S. Department of Education. This reduced her monthly student-loan payments, with the possibility that the outstanding debt could be forgiven in 20 or 25 years. On the other hand, her interest expense is climbing because of her smaller payments and the longer term for the loans. Smith tried to change her financial outlook with loan consolidation, budget discipline and a considerable amount of that old standby, delayed gratification. Through it all, though, Smith maintained a sterling credit rating in excess of 800 because she never missed a payment, even though her debt was increasing. Finally, she decided to ask for help through The Seattle Times’ Money Makeover program. The Financial Planning Association of Puget Sound matched Smith with Robin Tan and Landon Tan, a father-son team who work together at KMS Financial Services in Kirkland. The Tans, both financial planners, advised Smith free of charge. “It’s not going to be tolerable if it keeps going this way,” he said. The Tans examined Smith’s finances and discovered that her monthly debt payments of $1,070 consumed a third of her take-home pay of $3,300. Subtract $1,050 for rent, and Smith was left with $1,180 for all of her remaining monthly expenses. “Most people couldn’t do it,” Robin Tan said. The Tans’ first order of business for Smith was to apply the law of holes, an adage that says, “If you find yourself in a hole, stop digging.” They urged her to do whatever she can to spend less than she earns each month. A more comprehensive view of her household budget might help Smith find new ways to save money, the Tans said. They suggested youneedabudget.com, a subscription-based budgeting site that offers a free, introductory trial. Increasing Smith’s income would also help push her household finances reliably into the black. She was recently given a raise at work and may be in line for another raise this year. Taking a second job, even temporarily, could bring in money for saving and paying down debt. Next the Tans urged Smith to pay off her debts sequentially. When one debt is paid off, she should dedicate its monthly payment to the next debt, and so on in an accumulating stream of payments. Smith says she’s going to start by paying down her smallest balance, $1,800 on a credit card, and move up from there. The Tans advised Smith to sharply restrict her use of credit cards. Smith responded by putting her newest credit card in the freezer, where she buried it behind the frozen beef. Establishing an emergency fund — even a small one — would give Smith an alternative to borrowing money for surprise expenses, the Tans said. They suggested carrying a balance between $1,000 and $2,000, perhaps seeded early this year with an income-tax refund. Once her consumer debt is paid off, Smith should make her emergency fund large enough to pay for three to six months of living expenses. After Smith stabilizes her household finances, the Tans urged her to start saving for retirement. She could begin by signing up for her employer’s 401(k) retirement program, which offers a company match. Eventually, Smith wants to boost her career by going back to school and becoming a registered nurse. Working with the Tans was reassuring, Smith said. Among other things, they gave her a clear path forward, and it’s a path that she’s ready to take. The Tans were upbeat about Smith’s prospects.